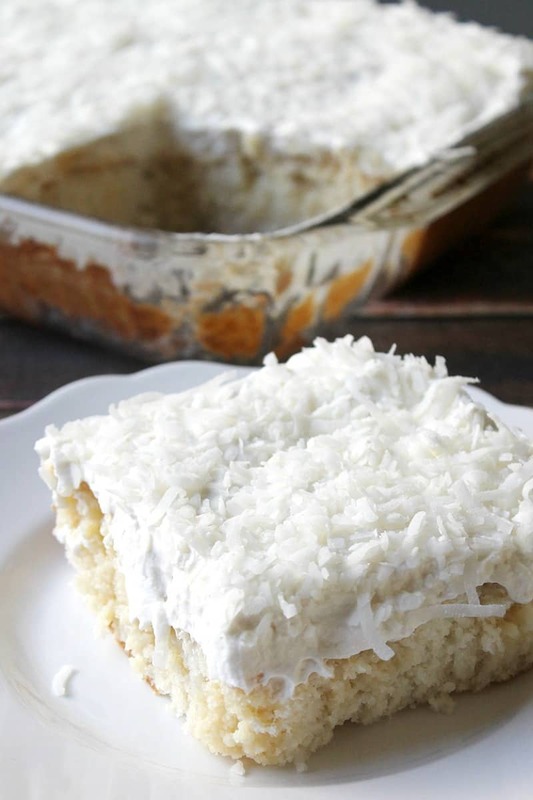 My Mom’s Best Ever Coconut Cake is dessert heaven! It’s a creamy cake topped with whipped cream that is easy to make and loaded with coconut flavor! I can’t tell you guys how many times I’ve made this recipe. It took me forever to finally bake it up, but once I did, I couldn’t stop! My mom made this cake one night when we came over to her house for dinner, and now I fantasize about it. The cake itself is moist (a weird word I know, but it totally applies here) and has a tender crumb with a subtle coconut flavor. Top that off with coconut flavored whipped cream and tons of shredded coconut and you’ll be in heaven! This cake takes steps. This is not an “I need a cake in 30 minutes for a party! Ahhhhh!” recipe. This is a step 1, wait, step 2, wait, step 3, eat kind of recipe. But once it’s done you can pop it in the fridge until your ready to serve, or just pry up the foil a little a eat it a fork full at a time when no one’s looking. I’d be the last person to judge you for that. Actually, I’d be right behind with my own bigger fork. Point being, I adore this cake and I’m sure you will too. And I totally have plans to hoard the whole thing and not share with anyone. Ha! Okay, I’ll probably pass some off to the neighbors so it doesn’t go to waste. I always end up making the whole recipe instead of a half (9-inch by 9-inch pan if ya want to do it though! ), but there are worse things in life than cake. 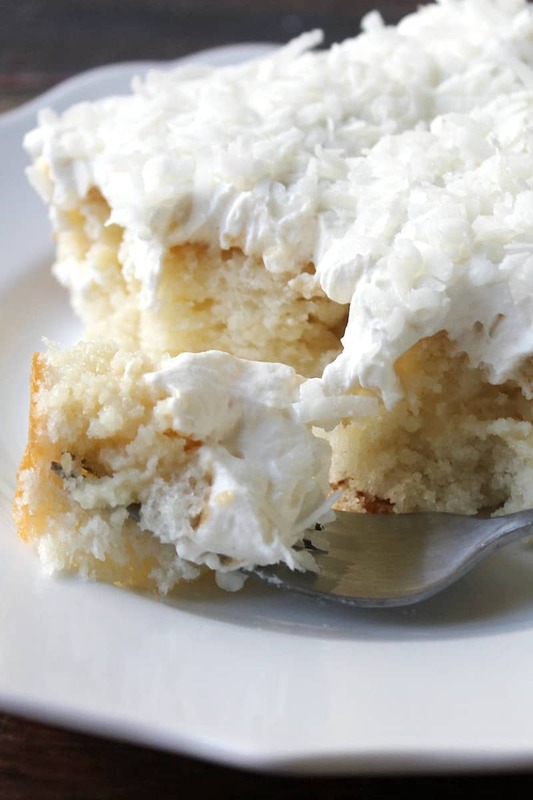 My Mom's Best Ever Coconut Cake is dessert heaven! It's a creamy cake topped with whipped cream that is easy to make and loaded with coconut flavor! Preheat oven to 350 degrees F. Grease and flour a 9-inch x 13-inch baking dish. In a medium bowl, sift together flour, baking powder, and salt; set aside. In a medium bowl, beat egg whites and cream of tartar until stiff peaks form; set aside. In a large bowl, cream together shortening and sugar. Beat in vanilla and coconut extract. Add flour mixture to sugar mixture, alternating with water, beginning and ending with dry ingredients. Fold egg whites into the batter until just combined. Pour batter into prepared baking dish, and spread evenly. Bake for 30 to 40 minutes, or until a toothpick inserted in the center comes out clean. Remove from oven and cool completely in the pan. Poke holes in the cake’s surface using the back end of a wooden spoon. Whisk together the evaporated milk and sweetened condensed milk; pour evenly over the cooled cake and allow to soak in. Beat together whipping cream, sugar, coconut extract, and vanilla until stiff peaks form. Spread whipped cream over the evenly over the entire cake. Sprinkle evenly with coconut. If desired, refrigerate before serving (at least 30 minutes) and store covered in the fridge. You can substitute all shortening instead of shortening + coconut oil. Just be sure to add 1/4 teaspoon coconut extract of you make this swap. If you want, you can make dairy-free coconut whipped cream by substituting coconut cream for the heavy cream and removing the coconut extract. My family loves Coconut cake, and yours looks amazing! Pinned to make for later! Thank you so much Christine! I hope you everyone loves it as much as we do! Hi Julie! 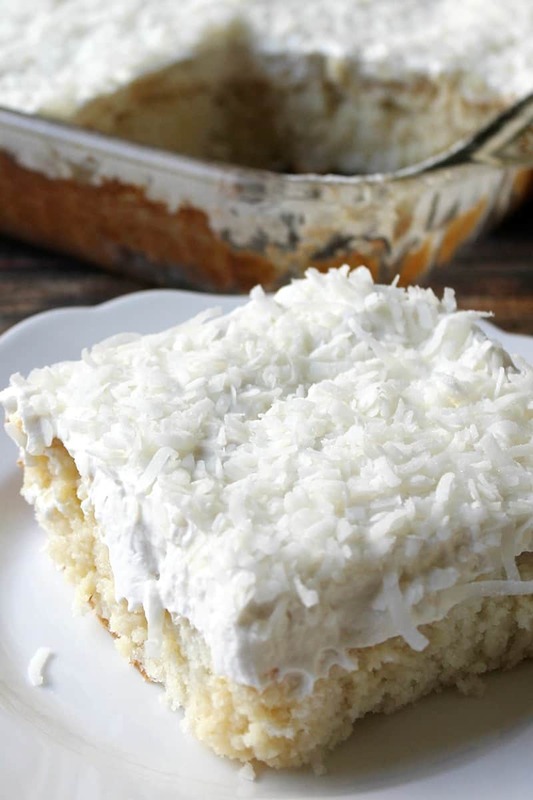 I am obsessed with coconut desserts! You, and your Mom, certainly know good eats! We just finished off the last of my caramel, pecan coconut brownies, so I’m definitely down with this cake! PS I’m a dive in with your fork person too! What a tremendous, out of the park, hit this cake was when I took some squares to a party. One person said it was the best cake they ever had and so light! The platter happened to be set in between 2 very thin people and they started with half a square each and continued to devour 3 big pieces, constantly adoring each bite with how delicious, light and easy to go down it is. Every time someone came up to the table they were encouraging them to try it; all loved every bite; such a big hit! I on the other hand was so pleased I only brought half so I can and continue to indulge in the other half! What a fantastic recipe!! Thank you. Butter will change the flavor of the cake and the texture slightly. The shortening is a neutral flavored fat. I use shortening to make this cake, but you can try butter if you want. Julie 😉 I have made a lot of cakes but never one with shortening. I feel a little intimidated for having ask you this question but do you use the crisco butter flavor shortening sticks for this cake or does it matter? I have never used the sticks because I have always used Butter or vegetable oil with my baking. Just a little curious. I am understanding that they both serve as shortening but one is Butter flavored? Help please 😉 Thank you for the recipe!! The cake is amazing, just one question… in the cake ingredients you indicate 1/4 tsp of coconut extract but you don’t mention to add it in the cake directions… I made the cake and didn’t add the coconut extract to the cake, only the topping. Hi Carole. What a space cadet moment on my end, I’m so sorry about that! You should add the coconut extract into the cake batter along with the vanilla extract. (I’ve updated the recipe to reflect this.) 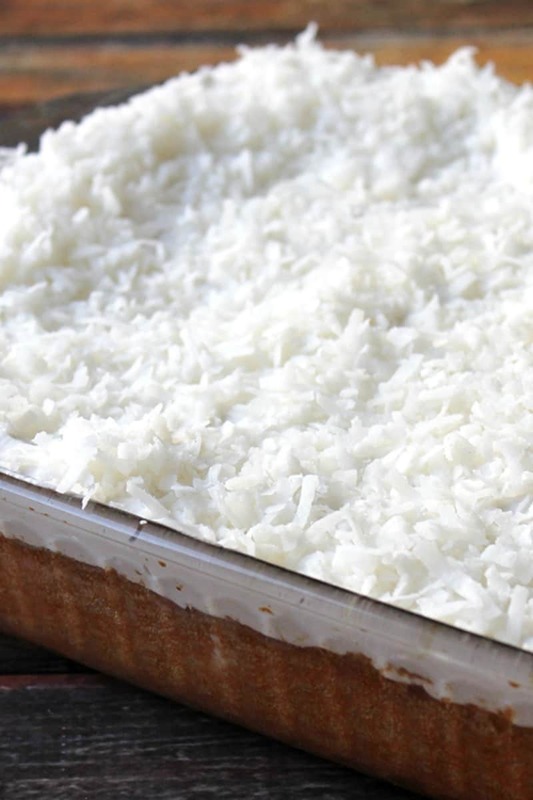 It’s just a little extra touch of coconut, but the cake is still delicious without it. I hope you enjoyed this recipe! Hi. I made this last weekend and it was fantastic! Followed the recipe to a T. After pouring the milks on the cake, I was a bit worried the cake would be to wet, almost soupy, but no! It was so moist yet still a cake. Everyone loved it. Thanks for a great recipe! Hi Julie, when you say shortening I take it Crisco is ok? White castor sugar? Mmm look forward to giving this a try!!! Hi Liz! Yes, Crisco is perfect. It’s what I use when I make this cake. 🙂 White caster sugar is fine too. Let me know what you think! Hi Julie, can this cake be made layer style. Can’t wait to make it, sounds yummy. Hi Glendora! You can totally turn this into a layer cake, That being said the frosting is whipped cream I’d choose something else for the filling (so the whipped cream doesn’t get smashed in between the layers), and then use the whipped cream on the outside or the cake, pressing the coconut into the sides. Or you could use a vanilla or cream cheese frosting for the whole thing. Totally your call. I made this cake in 2 9 inch round pans. I also did add the coconut extract. The most coconut flavor that I had in any coconut cake I made. The problem I had the cake stuck to the pans and did not come out. When I finally got it out (all broken up) ir was gooey on the bottom as if not cooked. Not sure if it was because I used the crisco to grease the pan along with the flour. wait to try this in my mama’s name. Soooo good! I made this for a family get together & it was a HIT! I am making it again this week for a potluck. My sister in law has already made it too! Thanks for sharing! Definitely a keeper! So so happy you all liked it! It’s my go to cake for just about anything. Good call on the coconut oil! So glad you liked it!! Did you put a total of 2/3 cup of coconut oil in replace of the shortening+ the original 1/3 cup of coconut oil in the recipe? Yes. If you want to use all coconut oil it would be 2/3 cup total. I typically use applesauce for shortening or butter. I will try it and let you know if it works. I’m thinking that with the milks, the cake will still be moist and yummy. Can’t wait to try! When do you use the coconut oil? It is in the cake recipe but not the cake directions. Why can’t I see the recipe?? I made this a couple years ago and LOVED it, but now the recipe isn’t showing up, just the video (which doesn’t show measurements). HELP! Hi Erika! I’m so sorry about the glitch on my end. 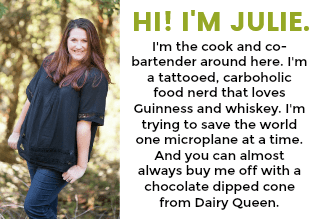 I changed recipe cards last week and am running into hiccups on the site. I’ve updated the recipe and it should be showing correctly now. Thank you so much for bringing this to my attention!! Hi Mick! It is supposed to be 5 ounces of evaporated milk. I’m sorry for the confusion in the wording. I’ve updated the recipe card in the hopes of clearing things up. The best option is to buy whatever size can you can find (usually 14 oz or 15 oz) and measure out what you need for the recipe. Hope this helps! You said “coconut extract” as the ingredient to be added in both the cake mix and the topping. I assume you meant to say coconut oil for the cake. I sure hope that is right because that is how I did it and it is in the oven. I guess I will find out.